How good has Houston Rockets star James Harden been this season? Good enough that no team could keep him from dropping 30 points on them. 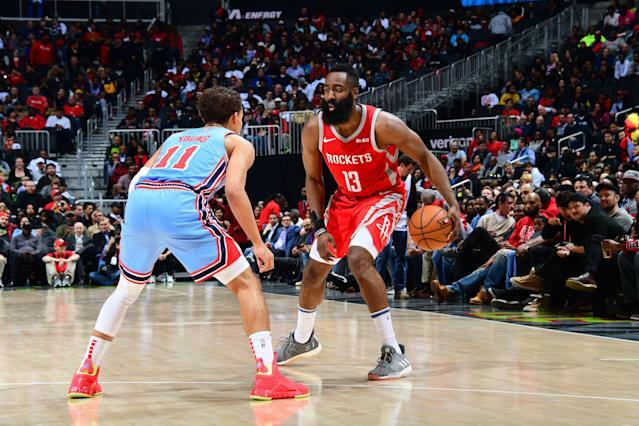 Harden managed the feat again Tuesday night, when he scored 31 points against the Atlanta Hawks in a 121-105 Rockets win. With that, Harden became the first player in NBA history to score 30+ points against all 29 teams in a single season. While the accomplishment may seem random, it puts Harden in some excellent company. Kobe Bryant managed to score 30+ points against 28 teams in 2005-06. Chicago Bulls legend Michael Jordan is the last player to score 30+ points against every other team in the league, but he did it when the league was smaller. Harden also managed to set another record during the contest. With his 11 three-point attempts, Harden set the record for most three pointers attempted during a season. Golden State Warriors guard Stephen Curry held the previous record, putting up 886 threes during the 2015-16 season. Harden finished the night with 890 three-point attempts this season. The Rockets still have 11 games left in the regular season. While Harden has been a prolific scorer throughout his career, he has taken his game to the next level this season. Coming into Tuesday’s game, the 29-year-old was averaging a league-leading 35.9 points per game. That’s up five points from last season, when he led the league with 30.4 points per game. Harden’s performance, combined with the Rockets’ record, has Harden listed as a strong candidate for NBA MVP. Toppling Milwaukee Bucks star Giannis Antetokounmpo for that honor might prove difficult, but fun stats like this could help Harden close that gap.